Posted on August 4, 2013 by revivewa	in Uncategorized and tagged National Council of Churches. Australian Heads of Churches demonstrate Christian unity at the National Council of Churches in Australia Forum. 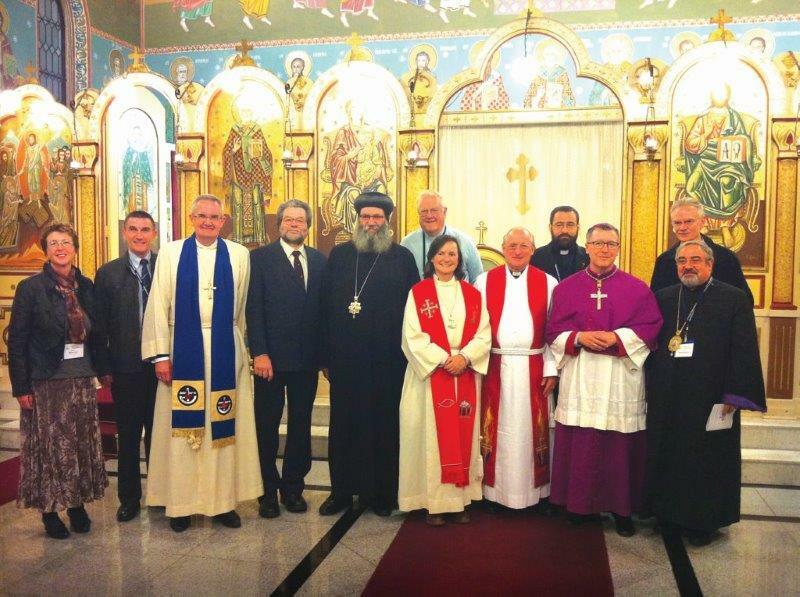 Australian churches have agreed to pray in solidarity with persecuted people in the Middle East at the recent National Council of Churches in Australia (NCCA) Forum held this past July in Melbourne. Delegates attended the Forum from the Uniting Church in Australia and a range of other denominations including Catholic, Anglican, Lutheran, Indian Orthodox and Coptic Orthodox traditions. Over the course of the week delegates agreed to a range of business items including changing the name of the Christian World Service Commission to the Act for Peace – NCCA Commission, acknowledging the contribution of Bishop Michael Putney to the Council as President from 2009–2013, and calling Australian churches to support recognition of Aboriginal and Torres Strait Islander people in Australia’s constitution. Rev Dr Mike Semmler from the Lutheran Church in Australia was commissioned at an ecumenical service during the forum as president of the National Council of Churches in Australia. Delegates also expressed deep concern and solidarity for the people of Egypt during its time of upheaval and agreed to send affectionate greetings from the Australian Council to the newly formed Egypt Council of Churches. Rev Dr Michael Kinnamon, renowned international ecumenical leader and educator gave the keynote address and a public lecture on ‘Why the Ecumenical Movement is a movement of Peace’. Michael inspired those listening with a message of ecumenical and interfaith action towards a common goal of peace including steps towards that goal: pray for those who are regarded as enemies of the state; practise seeking relationships with those we would normally avoid; seek partnerships with nearby congregations with different attitudes to conflict and join with other congregations in local activities that counter violence. Michael said that participation in ecumenism is vital in the journey to peace. “All churches should see themselves as peacemakers,” he said. ← Would you tell me, please, which way I ought to go from here?